The cabin sits in a quiet, wooded lot, has one bedroom downstairs with a loft and sleeps 6 comfortably. Open living downstairs with a large fireplace. From the cabin there are game trails to explore, as well as the river, and a fire pit for roasting marshmallows. Amenities in the summertime include the the pool and golf course, which are just a short walk/drive away. White Pass is 30 minutes from the cabin. From Memorial until Labor Day, the golf course is open. From Memorial to Labor Day the club pool and golf course is open. Cabin was very cozy. We loved the fireplace. On Saturday we woke up to a herd of elk walking through the yard! Great time. Would definitely stay here again. 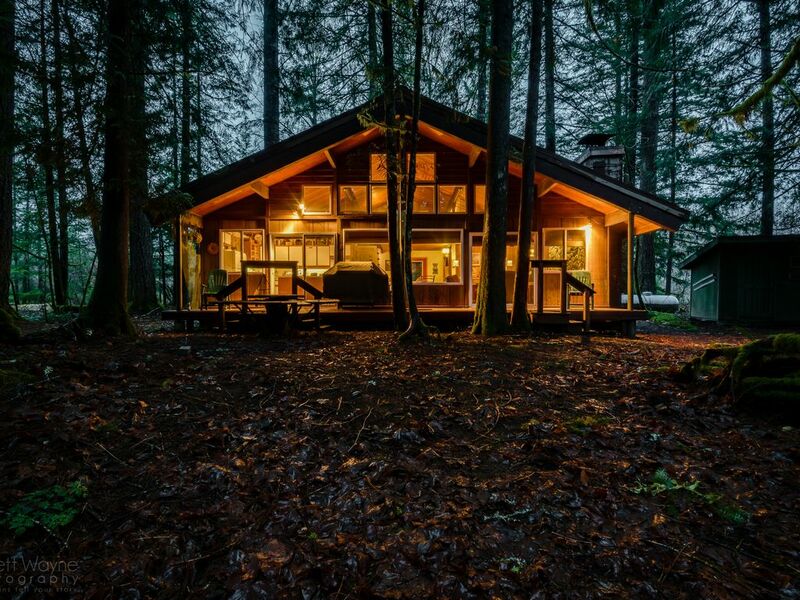 Cozy cabin with everything provided for a very comfortable and delightful respite in the woods. We skied everyday and thoroughly enjoyed evenings with a big crackling fire and great selection of movies! Perfect weekend getaway! The cabin was very clean and the fireplace was amazing. Had a wonderful weekend watching movies by the fire and exploring the area. Good location to White Pass! The cabin is very comfortable and well located for skiing at white pass. And Ann is a great owner-host. The previous renters had damaged a futon and she was all over trying to help. There r some items that need maintenance. WiFi would be awesome as att has no cell coverage. Overall good experience. Stayed at the Riverside Retreat for a friends’ ski trip to white pass and it was absolutely perfect. The cabin had all the amenities we needed, including fire wood; peaceful location next to the Cowlitz river; and less than 30 min away from the mountain! The cozy cabin was fully stocked with board games making for an action filled weekend with great company!